So What's The Big Deal With Egg Yolks, Anyway? The golden center is truly a buried treasure of nutrition and not at all the cholesterol soaked demon some medical science claims it to be. People have been catching flack from doctors and physicians for years over issues relating to cholesterol. One of the major scapegoats happens to be the egg, or to be more specific—the egg yolks. The golden center is truly a buried treasure of nutrition and not at all the cholesterol soaked demon some medical science claims it to be. Historically, the egg has been a necessary compliment to the other sources protein, such as meat, in our omnivorous diet. The healthcare industry overall is set in its belief that the cholesterol content within egg yolks is too high for people to consume on a daily basis without creating significant health risks over time. Cholesterol can collect around the interior of the arteries and some studies have suggested that this might be a response of the body to protect the artery walls. Whatever the reason, too much cholesterol is chiefly a problem when it causes a constricting of the blood flow and therefore high blood pressure. It's true that when you compare egg yolks to other foods they are relatively high in cholesterol, as the average egg contains anywhere between 190 and 215 milligrams. Cholesterol has also been linked by popular medicine to the overall deterioration of the walls of the blood vessels, contributing to strokes and heart disease. Take note that high cholesterol is not a disease itself, but rather a condition that health care professionals have linked to heart disease. It's true that when you compare egg yolks to other foods they are relatively high in cholesterol, as the average egg contains anywhere between 190 and 215 milligrams. Cholesterol is something that many people should be concerned about, but not so much in the case of eggs. Studies have shown that regularly eating eggs can actually lower your low density lipids (that's "bad" cholesterol to us lay people) and raises high density lipids. The dangers of a high cholesterol diet may also have been exaggerated in the media as some studies have proven that people who maintain a low cholesterol diet still may have elevated cholesterol levels. This is because cholesterol actually serves several important functions in the body, and when you don't get enough, it makes its own. In fact the liver produces about two thirds of the body's cholesterol, with dietary intake having very little impact on the overall levels. The benefits of cholesterol, especially from a natural source like an egg yolk, have been down played, while the risks may have been terribly blown out of proportion. Limiting dietary cholesterol intake is important but the real danger comes from saturated fats and trans fats. These two are greater factors in increased cholesterol than any typical intake of egg yolks. It doesn't make much sense to separate egg yolks to avoid the cholesterol while eating deep fried fatty foods, pizza and other junk in a normal western diet. Low fat meats like fish and chicken breast are a much preferred alternative among health conscious people. Even compared with these sources of protein the egg yolk contains a higher nutrition-to-fat content ratio. An egg yolk, while it may have a slightly higher fat and cholesterol content than say, steamed cod, it also contains more vitamins and fatty acids. The American Heart Association has settled on the recommendation that a healthy individual shouldn't exceed 300 milligrams per day and any individual with severe cardiac disease and other circulatory problems should limit their intake to 200 milligrams or less. The American Heart Association has settled on the recommendation that a healthy individual shouldn't exceed 300 milligrams per day and any individual with severe cardiac disease and other circulatory problems should limit their intake to 200 milligrams or less. This is a standard established some years ago and it may be time for a review and revision, or at least expansion on the guideline. What most healthcare professionals won't reveal to people is that there are numerous benefits to eating egg yolks as long as it's managed in moderation like anything else. It is easier, (and more lucrative) for a doctor to prescribe a pill that must be taken for the rest of your life. Too often a symptom is treated instead of the real problem. Keep the eggs, and lose the deep fried fat and red meats; that should be the more consistent message, resorting to chemistry only if necessary. Egg yolks actually contain all the healthy, fatty acids that are contained within the egg. It is a nucleus of wholesome goodness that supplied our ancestors with their sustenance since before they were upright. When you strip away the egg yolk and eat only the white, you're completely missing out on the benefits of those fatty acids like the Omega-3 fats. There is a line dividing many people about whether egg yolks are safe to eat, mainly due to the issues with cholesterol. The fact remains that the bulk of the nutrition in an egg comes from the yolk (including 1/5 of the total protein). Logic would dictate that if you are a person who has an issue with cholesterol, you shouldn't eat eggs on a constant basis, but when you do you should eat the whole thing. The issue of cholesterol is completely negligible and recent studies such as those performed by the University of Science have proven that other nutrients within the egg yolks can actually help the body manage the cholesterol intake. Vitamin B (particularly Riboflavin) has been known to aid in lowering cholesterol levels and the Lecithin within the egg prevents much of the cholesterol from even being absorbed within your digestive tract. There have also been some preliminary research done into the antioxidant Lutein which may reduce inflammation in the body, which is a much more deadly problem in the heart disease battle. For years weight lifters have been consuming raw eggs as means of extracting the most nutrition out of the egg. Heating the egg does cause some chemical changes that damage some of the nutrition, but not too much. Also some people diagnosed with an egg allergy find that they can eat raw eggs without any reaction at all. Raw eggs are very easy on the digestive system. It is not uncommon, however to experience some stomach discomfort when starting a new raw egg regimen. The nutritional experts that advise this behavior insist that it is a cleansing action, and is strictly temporary, eventually leading to a much leaner running human machine. The best way to consume a raw egg is to crack it open into a glass and swallow it whole. The best way to consume a raw egg is to crack it open into a glass and swallow it whole. This may be repulsive to you, but it is a habit that most people can get into. If you have a problem swallowing the yolk whole, you may wish to slice it in half with a knife. Beating the egg is not recommended however, unless it is whipped with some milk or cream. There are nutrients that oxidize and become useless to the body unless they have something to bond to, which the milk provides. Salmonella is commonly feared as a micro organism that is sometimes found on the surface raw eggs. This infection causes a series of gastrointestinal problems, and is usually curable with pro-biotics. In very rare cases where the victim is already suffering an immune system deficiency or the source is unusually highly contaminated, people can die from Salmonella poisoning. 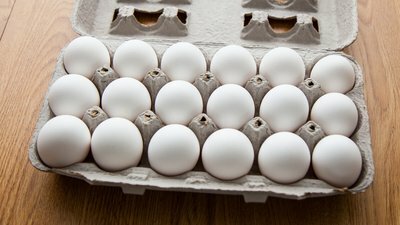 These horror stories have done much damage to the reputation of the egg, but the truth is that fewer than one in 30,000 is tainted. Most eggs are of the huge factory farm variety. The chickens are kept in tiny cages where they are unhealthily confined. Organic, free range farm eggs have even less chance of contamination because only sick chickens lay Salmonella eggs. Of course an egg should never be consumed if the shell is damaged at all. The sad truth is that most people have never held a really healthy egg. When compared to a grocery store egg, an organic egg has a much thicker shell. The yolk of an organic egg is also much more robust orange color when compared to the sickly yellow of a factory farm egg. The more one learns about the nature of eggs, the more one begins to realize that if we want to take into our bodies something that is wholesome and good for us, it must come from a healthy source. Some people would consider this common sense, but all too often the convenience and the profit over rule what we should already know. In general mass produced caged chickens that are fed a diet of bone meal and other additives produce eggs of inferior nutritional value when compared to free range organic eggs. In general mass produced caged chickens that are fed a diet of bone meal and other additives produce eggs of inferior nutritional value when compared to free range organic eggs. The price is higher, but in this case you get what you pay for. A free range chicken consumes a much more natural diet therefore producing eggs with superior Omega level-3 and nutrient content while mega farm eggs have less of the good stuff and more Omega level-6 fatty acids. Eggs and the egg yolks within provide significant health benefits when eaten properly. Having egg yolks or whole eggs several times a week will not significantly elevate your cholesterol level or create excess fat that is unmanageable. It is important to remember that a proper balance is necessary when physical health is your goal. Too much of anything isn't good for you and the same goes for egg yolks. Eggs are a healthy part of a regular diet, and require moderation just like the other things we consume. It should go without saying, but always bears repeating, that it doesn't matter what you eat if you neglect to challenge your body physically. A person cannot expect to achieve a healthy body without a regimen of regular exercise. This is part of balancing your life to fit your needs. A strong heart and a fast metabolism are byproducts of cardio workouts. Combined with a healthy diet (including whole eggs) these steps will decrease your overall chances of having problems with heart disease. Health is a product of mental and physical discipline. Eggs shouldn't be consumed on a daily basis. Even though the cholesterol is better managed by the Lecithin and Vitamin B, it still can create an excess of cholesterol, particularly in individuals who already have elevated LDL and HDL levels. Proper health maintenance comes from educating ourselves about what our body needs and how it reacts to different foods. Not everyone reacts the same way to the same foods. The egg yolk isn't our enemy. It is an innocent bystander in a war to decide what is good for us. Independent research has shown us that the egg is a good reliable food for maintaining an overall healthy life when consumed with an ounce of reason and pound of good information.